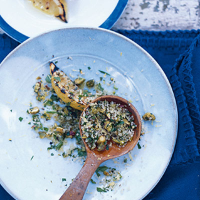 Lemon quarters are chargrilled on the barbecue to give them a fantastic zesty flavour, which is just the boost the couscous needs. Place the couscous in a large bowl. Pour over 400ml of boiling water and immediately cover with clingfilm and allow to stand for 5 minutes. Finely grate the zest from the lemons and reserve. Cut the lemons into quarters. Scrape a fork over the surface of the couscous to break up the individual grains. Roughly chop the herbs and add with oil and lemon zest, then season generously. Roughly chop the pistachios and add them to the mixture. Use the lit barbecue or preheat the grill to high, and cook the lemon wedges for about 3-5 minutes, turning once during cooking until just beginning to char at the edges. Using tongs, squeeze the juice from the hot wedges over the couscous and mix in well. Serve immediately.